While using the Camera app, press the Menu soft button. Touch the Settings icon on the Control Drawer (refer to the figure). Ensure that a green check mark appears in the Geo-Tag box. If not, touch the gray box to put a check mark there. Press the Back soft button to close the Settings menu, and then press the Menu soft button to withdraw the Control Drawer. Not everyone is comfortable with having the phone record a picture’s location, so you can turn the option off. Just repeat these steps, but in Step 3 remove the green check mark by touching the box. Your Droid Bionic is more phone than camera ― still, it has various camera adjustments you can make. 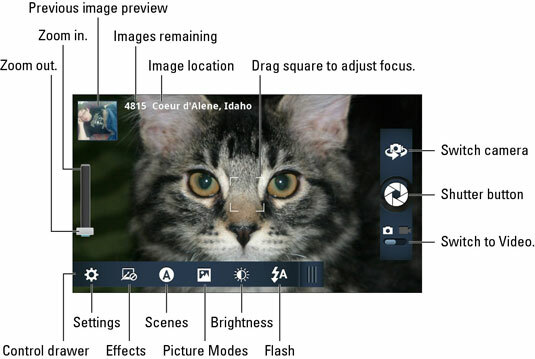 Two such adjustments are found by touching the Control Drawer (refer to the figure) and choosing either the Effects or Scenes icon. Effects: Add special visual effects by touching the Effects option and then swiping up or down. The picture preview in the Camera app shows you how the chosen effect changes the way things appear. Choose the Normal option to remove an effect. Scenes: Choosing this item lets you configure the camera for taking certain types of pictures. After touching the Scenes icon, choose an option that describes the type of images you’re capturing, such as Sport for quick-action, Night Portrait for low-light situations, or Macro for close-ups. The Auto setting directs the camera to choose the best scene by guessing randomly. Icons representing the current Effects and Scenes setting appear on the Control Drawer. Refer to the figure for the location of the Effects and Scenes icons.